Nigeria’s outstanding No10 Kelechi Iheanacho put on a dazzling display of football in United Arab Emirates, scoring six goals and setting up a further seven en route to a fourth title for the west Africans. A playmaker and lethal finisher all rolled into one, his trademark goal celebrations had the Nigerian fans in UAE on their feet from start to finish. FIFA.com caught up with the best player of the 2013 U-17 World Cup in the United Arab Emirates to talk about how it feels to be a world champion, his chat with Nigerian legend Nwankwo Kanu and why he had doubts about his size and strength when he was called into the national team camp. How does it feel to be a world champion? Kelechi Iheanacho: I feel good, I feel good, I feel good! I thank God because I feel so good. I don’t know if I can find the words to say what I’m actually feeling. I can’t even tell what I’m feeling because I’m feeling a millions things at the same time. I am feeling love for my teammates and my family and my country. I feel all of it. I’m on a high for winning the World Cup and the Golden Ball [best player]. It’s all smiles here in the locker-room. How close to you feel to your teammates at this moment? None of this could have been possible without my teammates. They are the best. The way we all cooperated together to win the World Cup is simple amazing. It’s like nothing else I’ve ever felt. I give them thanks for making it possible for us to do what we did. You were named the tournament’s best player and you were the second top-scorer. How does that feel on a personal level? It means a lot to me personally because when I came into the national team camp I felt uneasy. A lot of the boys thought maybe I was too small, too skinny to be a good player. But I realized now with what I’ve done here that God is preparing something special for me. 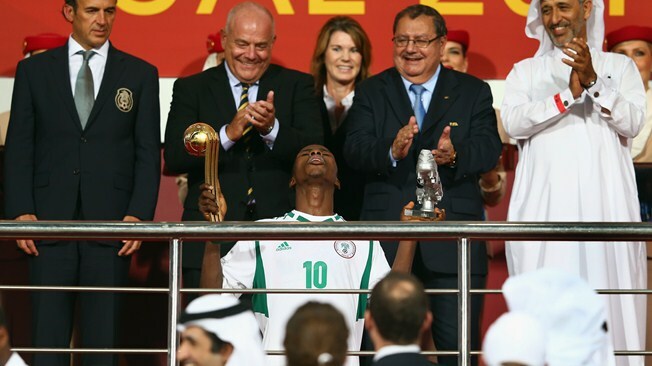 It’s been an exciting few weeks for you and your Golden Eaglets here in the United Arab Emirates. How has your time been? I’ve loved the time I’ve spent here in UAE. It’s a wonderful country and it was amazing for me and my teammates to see a different part of the world and to show our football to the people here. I will remember it always. You had tremendous support from Nigerian fans here for all of your games. How important was that? The fans here have supported us so much. It’s been incredible. They’ve given us courage and cheered us up when things weren’t going so well. The fans here in the stadium and the ones back home, they own a part of this trophy too. They helped us to win it. One of Nigeria’s best-ever players, Nwankwo Kanu, was here to watch the final, and you two had a long chat after the whistle. What did you talk about? He is the true hero of football in our country. Back home, he’s like a father, like a brother. He’s like everything to me. He always gives us advice. He comes to train with us, to make sure we’re happy and moving in the right direction. He helps us to understand what football is really about, and what it takes to make it in the game. Talking with him and being with him is just a great honour. Do you have a message for the people back home? I just want to send my love back home; to everyone and to everything Nigerian.